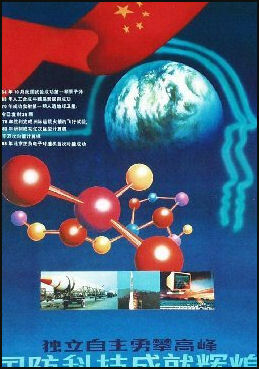 Science poster China has one foot in the 20th century and another in Middle Ages. The Chinese have built sophisticated nuclear weapons and rockets; Chinese genetic engineers synthesize medicines; and Chinese surgeons perform challenging surgery. But at the same time you can still see peasants planting rice by hand, pulling boats upstream with ropes and mixing concrete with shovels. China is regarded as a member of the top tier in robotics. It plans to send robotic probes to the moon in the next few years and is working in a robotic lunar rover. Many Chinese crave anything new. They are fond of gadgets are very much engaged in the world of cell phones, text messaging, gaming and the Internet. The only things that limits them is money. China is establishing world class universities and research centers and creating large pools of talent in fields such as chemistry and physics that are becoming increasingly unglamourous in `the United States. For China to advance further, according to an OECD report, it must offer better protection for patents and intellectual property, increase cooperation between the state and private enterprise and reform markets to make them more competitive. As it stands China depends too much of technology imported from abroad. Chinese science is advancing in leaps and bounds and quickly moving to become a major force in both applied and basic research. John Pomfret wrote in Washington Post, “China has invested billions in improving its scientific standing. Almost every Chinese ministry has some sort of program to win a technological edge in everything from missiles to medicine.” In May 2010, China unveiled the world’s second fastest supercomputer, The Shenzhen-based BGI company has sequenced he genes of a chicken, a silkworm, a panda, a strain of rice and 4,000-year-old human remains from Greenland. With the purchase of 128 cutting edge sequencing machine in 2010, BGI alone has come close to surpassing the genetic sequencing capabilities of the entire United States. China now ranks second behind the United States in the number of research articles published in scientific and technical journals world wide. China is also ranked second only to the United States in scientific research productivity and is on track to claim the No.1 position. The number of published papers by Chinese scientists has increased fourfold between 2000 and 2009, when 125,000 papers published according to Thompson Reuters. By contrast Japan had 78,500 papers published in 2009. According to a report by the Royal Society Science Academy, China rose from sixth to second place in the world’s authorship of scientific research papers between the periods of 1993-2003 and 2004-08. Research and development expenditures have grown faster in China than in any other big country---climbing about twenty per cent each year for two decades, to seventy billion dollars in 2008. But at the same time China is also a leading source of “junk” patents---ridiculous claims of “inventions” that “are little more than snake oil scams.” Plagiarism and doctoring results are a big problem, A study by Wuhan University estimated that enterprises that specialize in bogus reports made $145 million in 2009. See Education. Cong Cao, a professor of international relations at State University of New York and expert on the Chinese academic elite, told AFP that China has the “hardware” in terms of research facilities ro succeed. “But in terms of software---whether the system is really ready to produce first class work---I’m still not sure,” he said. Some of the best minds at work in science in both China and the West are Chinese . Seventeen-year-old Zhao Bowen was part of the team of high schoolers that worked out the genetic code for the cucumber in Shenzhen. MIT, Stanford, Harvard and other American, European and Japanese universities are filled with Chinese students doing cutting edge research. Perhaps most significant is that Chinese students and researchers trained at foreign universities, particularly those in the United States, are returning to China. The national Institute of Biological Science, known as NIBS, which is responsible for half of the peer reviewed publications in China, is led by a director and deputy director that are both returnees from the United States. Another secret to success is keeping some distance from Beijing. Pomfret wrote, BGI, for example, “seems to be insulating itself from China’s Communist bureaucracy...BGI started as the Beijing Genomics Institute in the early 2000s but left Beijing in 2007 after the Ministry of Science and Technology tried to dictate what it could and could not study... The Shenzhen city government offered it millions of dollars in grants and operating expenses to move south. Last year, BGI received a $1.5 billion line of credit from the China Development Bank. The merits of some of the cutting edge research is debatable. More than 200 institutions use controversial stem cell therapies to treat a variety of diseases, injuries and birth defects although none of the techniques have been subject to rigorous clinical trials and were only regulated by the government in 2009. We also visited the new Shanghai Advanced Research Institute, another arm of the Chinese Academy of Science. This gigantic science and technology park is under construction and today consists of four buildings, but it will grow to over 60 buildings on a large piece of land equivalent to about a third of a square mile. It is being staffed by Ph.D.-caliber researchers. Their goal statement is fairly straightforward: "To be a pioneer in the development of new technologies relevant to business." All of the various institutes being run by the Chinese Academy of Science are going to be significantly increased in size, and staffing will be aided by a new recruiting program called "Ten Thousand Talents." This is an effort by the Chinese government to reach out to Chinese individuals who have been trained, and currently reside, outside China. They are focusing on those who are world-class in their technical abilities, primarily at the Ph.D. level, at work in various universities and science institutes abroad. In each year of this new five-year plan, the goal is to recruit 2,000 of these individuals to return to China. Long March rocket Chinese researchers at the Center for Developmental Biology at the Shanghai Second Medical University have grown human stem cells from rabbit eggs. A team led by a woman scientist, Huizhen Sheng, fused human eggs with rabbit eggs which in turn yielded human stem cells, which scientists hope in the future can be used to treat paralysis and help burn victims replace lost skin, among other things. The Chinese have developed a heat sensitive paint that absorbs heat at temperatures below 20̊C and reflects heat at temperatures above 20̊C. Variations of paint, which use a substance called crystal violet lactone, can change color with the seasons. In February 2007, Chinese scientists announced that had succeeded in controlling the flights of pigeons---commanding them to fly left or right or up or down---using micro electrodes inserted into their brains. Chinese scientists have produced a harp-playing robot. Wu Yuli, a farmer who makes robots from scrap metal, pieces of wire and old motors and other stuff lying around his barn, has made 25 robots, which he refers to as his sons. His most advanced one pulls a cart, one step every three or four seconds; serves tea; and lights cigarettes. He sold it for $3,750. In April 2009, China announced that it would build Asia’s largest stem cell research center. The month before Chinese scientists announced they had created stem cells from mouse skin and used the cells to produce fertile live mouse pups. Chinese-born scientist Xiangzhong “Jerry: Yang cloned the first farm animal (a calf) in the United States at the University of Connecticut in 1999, three years after Dolly the sheep was clone. China is competing with the United States, Europe and Japan to build the world’s fastest computer. In 2005, China unveiled a supercomputer than can perform 11 trillion calculations a second. Around the same time researchers at Tsinghua University produced microprocessors that matched Intel’s Pentium III. As of August 2005, China had 19 supercomputers on the list of 500 fastest supercomputers in the world. China has invested heavily in an effort to break the peta-flop computer barrier (1,000 trillion calculations a second) by 2010 and have made the issue a matter of national pride. China had the world’s fifth fastest supercomputer as of November 2009. The National University of Defense Technology Milky Way at the National Supercomputer Center in Tianjin performs 563 trillion calculations per second. The fastest supercomputers at that time were : 1) the Cray Jaguar at Oakridge National Laboratory in the United States with 1.759 quadrillion calculations per second; 2) the IBM Roadrunner at Los Alamos National Laboratory in the United States with 1.042 quadrillion calculations per second. 3) the Cray Kraken at the University of Tennessee in the United States with 832 trillion calculations per second; and 4) the IBM Eugene at Juelich Research Center the United States with 826 trillion calculations per second. Astronomers from China and the United States may cooperate on building the world’s largest telescope: the Thirty-Meter Telescope conceived by scientists at Berkeley and Cal Tech, which is expected to completed in 2019. In November 2010, China’s Tianhe-1 (meaning “Milky Way-1" ) was named the world’s faster supercomputer after it achieved a computing speed of 2,570 trillion calculations per second. The Jaguar at a U.S. government facility, the previous No. 1, was second with 1,750 2,570 trillion calculations per second. The Tianhe-1 is located at the National Center for Supercomputing I Tianjin. Since it was named No.1 in 2011 it has been displaced at the top by faster American and Japanese machines, namely a rival Japanese machine, the K Computer, designed by Fujitsu. Tianhe-1A can perform mathematical operations about 29 million times faster than one of the earliest supercomputers, built in 1976. For the record, it performs 2.5 times 10 to the 15th power mathematical operations per second. Most of the key components in Tianhe-1 are U.S.-designed chips. Mr. Dongarra said a long-running Chinese project to build chips to rival those from Intel and others remained under way and looked promising. “It’s not quite there yet, but it will be in a year or two,” he said. The Sunway system, which can perform about 1,000 trillion calculations per second---a petaflop---will probably rank among the 20 fastest computers in the world. More significantly, it is composed of 8,700 ShenWei SW1600 microprocessors, designed at a Chinese computer institute and manufactured in Shanghai. Currently, the Chinese are about three generations behind the state-of-art chip making technologies used by world leaders such as the United States, South Korea, Japan and Taiwan. “This is a bit of a surprise,” said Jack Dongarra, a computer scientist at the University of Tennessee and a leader of the Top500 project, a list of the world’s fastest computers. In the fall of 2010, another Chinese-based supercomputer, the Tianhe-1A, created an international sensation when it was briefly ranked as the world’s fastest, before it was displaced in the spring by a rival Japanese machine, the K Computer, designed by Fujitsu. But the Tianhe was built from processor chips made by American companies, Intel and Nvidia, though its internal switching system was designed by Chinese engineers. Similarly, the K computer was based on Sparc chips, originally designed at Sun Microsystems in Silicon Valley. Dr. Dongarra said the Sunway’s theoretical peak performance was about 74 percent as fast as the fastest United States computer---the Jaguar supercomputer at the Department of Energy facility at Oak Ridge National Laboratory, made by Cray Inc. That machine is currently the third fastest on the list. The Energy Department is planning three supercomputers that would run at 10 to 20 petaflops. And the United States is embarking on an effort to reach an exaflop, or one million trillion mathematical operations in a second, sometime before the end of the decade, though most computer scientists say the necessary technologies do not yet exist. To build such a computer from existing components would require immense amounts of electricity---roughly the amount produced by a medium-size nuclear power plant. In contrast, Dr. Dongarra said it was intriguing that the power requirements of the new Chinese supercomputer were relatively modest---about one megawatt, according to reports from the technical conference. The Tianhe supercomputer consumes about four megawatts and the Jaguar about seven. The ShenWei microprocessor appears to be based on some of the same design principles that are favored by Intel’s most advanced microprocessors, according to several supercomputer experts in the United States. But there is disagreement over whether the machine’s cooling technology is appropriate for designs that will be required by the exaflop-class supercomputers of the future. The Chinese-built Tianhe-1A created an international sensation when it was briefly ranked as the world’s fastest. But the Tianhe was built from processor chips made by American companies, Intel and Nvidia, though its internal switching system was designed by Chinese engineers. 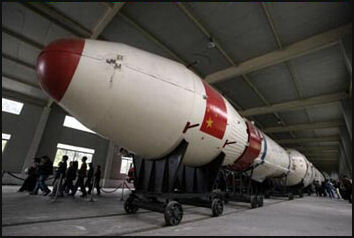 In 2006, according to OECD statistics, China surpassed Japan in spending on research and development. It spent an estimated $136 billion, ahead of $130 billion by Japan and behind $330 billion spent by the United States. Chinese research and development spending is fueled by the booming economy, the government focus on growth and spending by Chinese companies in sectors such as telecommunications and biotechnology. China ranks forth in the world in patent applications behind Japan, the United States and South Korea. The number of patent applications in mainland China increased 800 percent between 1995 and 2005. China employs 926,000 researchers compared to 1.3 million in the United States. Chinese institutions spend 1.2 percent of GDP on research and development compared to 3.2 percent in Japan and 2.6 percent in the United States. China’s research and development spending grew from $17 billion in 1995 to $94 billion in 2004, doubling in that time in terms of percentage of GNP from 0.6 percent to 1.2 percent. In the same period the number of researchers in China grew 77 percent. The quality of the research is a matter of some debate but the growth is stunning nonetheless. Many foreign companies are setting up research facilities in China to develop products for the Chinese market. They are also employing more and more Chinese engineers and scientists, who work for a fraction of the salaries paid in Europe, the United States and Japan. At the same time China often tries to get foreign companies to complete projects such as nuclear power plants and fast trains in China so it can acquire their technology and ideally copy it for use in the future. Zhangjiang High Tech Park in Shanghai is a major center of research and development. Companies here are developing health products and cosmetics based on Chinese medicine, third generation cell phones. Nationwide more money is going into high technology research and development. Spending for biotechnology research, for example, rose from $31.5 million in 1986 to $272.4 million in 2002. Because American scientists and engineers get paid six to ten times more than their Chinese counterparts the United States significantly outspends the Chinese in research and development but uses less scientists and engineers. Investment into research and development, driven by China's businesses and its state-funded universities, easily outstripped money poured in by Germany, France and Britain, countries that were near the top of the list two decades ago. Research and development is seen as a key driver of technology-based industries but spurs growth across all sectors. Two Million Chinese Patents by 2015? Chinese Patents: A Threat o the United States? Backed by the Bill and Melinda Gates Foundation, Chinese medical researchers, partnered with a firm in the U.S. beat out an Indian team to develop a new test for cervical cancer, that cost less than $5, in 2009. In 2008, the Ministry of Science and Technology gave researcher two years to come up with 30 new medicines for clinical trials and only few days to apply for money to fund the research. This was even though in the last 60 years Communist China had only developed only one internationally-recognized drugs, the anti-malaria drug Artemisinin. In April 2010, Chinese scientists at the National Institute of Biological Science in Beijing announced in an article published in Nature that they discovered a gene believed to be responsible for fat growth and obesity while doing studies of genes in different ethnic groups--- Caucasians Chinese, Japanese, and South Koreans---and want to use the finding to design a means of shutting down the gene down in an effort to fight obesity.